You are here: Home » Uncategorized » Joint or Individual Life Insurance? 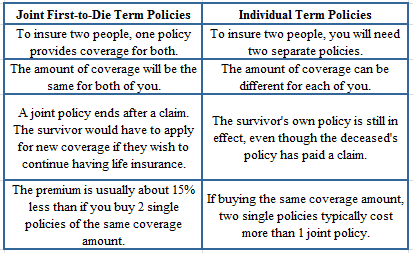 Joint or Individual Life Insurance? If you’re in a long term relationship you may be thinking that it’s time to purchase life insurance. This is a good idea especially if your lifestyles are dependent on each others efforts (i.e. child rearing) or income. Is there a measurable financial risk to someone dying prematurely? Is this risk manageable without life insurance? If not, then you need life insurance. Sometimes it makes sense to purchase a joint policy, especially when there is a joint risk such as a mortgage balance. By purchasing a point policy you get good coverage and can save up to 15% on the expense. Below is a list of the pros and cons of Joint Life Insurance vs. Individual Life Insurance. Find out more and compare quotes today – CONTACT US NOW!! From the time you marry, buy your first home, or start a family; having the right life insurance means that you and your loved ones have peace of mind.